So it's official, more and more older people are travelling further on their holidays. The most popular countries for people aged over 85 has traditionally been countries such as Spain, France, Italy and Greece. These EU countries still take in the bulk of older travellers from the UK but increasingly they are seeking destinations further afield. Expected growth area include America, Australia and the Far East. 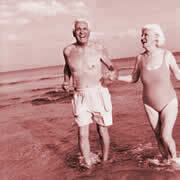 The travel cover providers below all cover the over 85s worldwide. Older people are now the largest group taking holidays and travelling from the UK! The over 50s are now accounting for more than half (51%) of overseas holiday spend and 43% of all UK tourism spend, according to travel insurer LV. Whilst the under 50s continue to struggle with belt-tightening, the over 50s spend £17.6bn on travel every year, and this figure is predicted to almost double in a decade.